Hello, my name is William. I am 46 Years old and live with my Wife and four kids. A couple of months ago, May to be exact, I had impingement surgery on my hip. I might also mention that I am a Left above knee Amputee that suffers from upper extremity nerve damage which makes it extremely difficult to ambulate. Under normal circumstances, if I am not wearing my prosthesis, I require the use of my wheel chair. This is where M+D became part of my every day vocabulary. I was scheduled to have surgery and realized that I would not be able to wear my prosthesis for some time after my procedure. 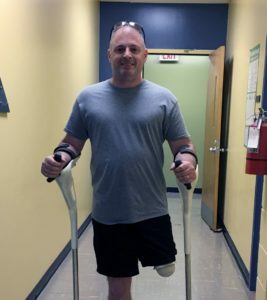 (No one knew exactly how long the swelling and pain would take to subside) My wife had discovered, via Social Media, a company here in Kansas City that had taken the old “Crutch” idea and revolutionized the way they would be designed and used. For me, I was ecstatic, hopeful that the crutches would allow me the freedom and mobility that I would lose being restricted to a wheelchair as I am unable to use the standard everyday crutch. I was already getting in to that “rehab remorse” mode. To say it was life changing would be somewhat of an understatement. When I first began using the crutches there was definitely an adjustment period. My brain was trained to use crutches only the one way, mechanically. With the M&D crutches you have to think about them as an extension of your arms and not some clunky mechanical piece of metal like the standard crutch. It took me about 10-15 minutes of use to get the hang of it and the way they feel is incredible. I no longer had to be concerned about armpit soreness, wrist fatigue, forearm cramps or any of the other common ailments that come with “Crutches”. I was also able to leave my washcloths and electrical tape alone. No, no armpit rash to worry about with these. As I began to get more comfortable with the M+D crutch, and I knew that fatigue was not going to be an issue, I was more willing to go and do things with my family. There is something that happens to your brain when you understand that all of the problems that come with a standard crutch would no longer be of concern. Whether I was waking up with a better temperament from knowing that my wheelchair was not my only option, to having the ability to get out and enjoy the day with my family. Having the confidence that I would not be completely exhausted by the end of the day and also knowing that my family would not have to deal with the consequences that come with using crutches, makes those every day difficult decisions, easy. The M+D crutches were/are a life changing experience for those of us who need to use crutches for long term use or extended rehabilitation. I must warn you, once you use the M+D Crutches, you will realize that going back to your archaic mode of mobility is not an option. It is one of the more simple decisions that a person in my position can make. It checks all of the boxes that I require to make a change. Will they improve my quality of life? Will they improve the life of those around me? Will I be able to be more active? Will I have more energy? Will I no longer hesitate at participating in activities that I would have otherwise balked at previously? The answer to all of these questions is a resounding “Yes”. M+D has done for the crutch what Henry Ford did for the horse and buggy. Used innovation, technology, hard work and most of all… Heart. To change the way recovery, rehabilitation and long term use of crutches will be viewed in the future there should be only one option, Mobility Designed.